On Tuesday, Bernie Sanders (I-Vt.) unveiled the most comprehensive bill yet to help Puerto Rico and the Virgin Islands recover from Hurricane Maria. Far more ambitious than the scattershot federal efforts to-date, the bill asks for $146 billion to overhaul the islands’ energy, medical and housing infrastructure, provide debt relief and fund environmental cleanup. Senator Kristen Gillibrand (D-N.Y.), one of the bill’s co-sponsors, dubbed it a “new Marshall Plan” after the plan put in place to help Europe recover after World War II. The question is, would it work? Can this bill help the two islands coping with an estimated $94 billion in damages and billions more in debt build back so that they’re more resilient to future storms? According to experts who spoke with Earther, the answer is yes—in terms of its scope and the political will on the islands. But Republicans control of all branches of the federal government, making passing the bill a steep hill to climb. More than two months after Hurricane Maria tore through Puerto Rico and the U.S. Virgin Islands, millions are without power, schools remained closed, and the death toll continues to mount. There’s also an intense brain drain as Puerto Ricans abandoned the island for the mainland. The economic impacts could be felt for years to come. So far, federal help for the islands has been piecemeal and marred by contracts awarded to outside companies under sketchy circumstances that haven’t panned out. Tiny Whitefish Energy received a shady $300 million contract to restore power to some of Puerto Rico. More recently, a Florida firm with no experience failed to deliver on a $30 million contract to deliver tarps to the island. Donald Trump signed a relief bill with $4.9 billion in loans to Puerto Rico, and asked Congress to pass a $44 billion aid request. That aid would be disbursed across all areas that were hammered by hurricanes this year across the Caribbean and Gulf Coast, though. “This request does not come close to what local officials say is needed,” Rep. Nita Lowey (D-N.Y.), told the AP when the proposal, which was also denounced by Texas’ Republican governor, was floated two weeks ago. In contrast to these slapdash efforts, the Sanders bill takes a wholesale approach to recovery. For Puerto Rico and the U.S. Virgin Islands, a huge portion of getting the islands ready for the next storm is remaking their power grids to be resilient. There are a number of ways to do that, from decentralizing power generation to reducing reliance on expensive fossil fuel imports. To that end, the bill sets aside nearly $500 million for grants to territory and local governments, as well as homeowners to install renewable energy capacity and improve energy efficiency. The latter is a nod to the bill’s bigger ambitions to improve the daily lives of Puerto Ricans by reducing energy costs and ensuring grid reliability even in the absence of a major storm. The bill also limits privatization in an effort to stave off any runs at Puerto Rico’s public infrastructure by mainland corporations (cough, cough Whitefish Energy). BUDPR is one of 75 organizations to support the bill, a list which includes large environmental groups like Greenpeace and 350, Hispanic groups like the Hispanic Federation and Green Latinos, and local Puerto Rican relief organizations. San Juan Mayor Carmen Yulin Cruz, an outspoken critique of President Trump’s response so far, has also voiced support for the bill. Ponce Ruiz spoke to Earther from Puerto Rico where he was visiting family and meeting with local groups to drum up more support for the bill. The bill also contains $13 billion for reconstruction through the Federal Emergency Management Agency. But there, it makes a novel request. Currently, FEMA can only build back what was once there. The Sanders bill changes that, expanding the use of funds to include grid improvements. In the case of Puerto Rico and the U.S. Virgin Islands, that’s a huge deal. The energy systems that were there ran on costly oil imports, and relied on rickety grids that completely failed during the storm. Building it back the same way isn’t rational, especially knowing the prospect of climate change-fueled storms means more destruction is likely. Renewables won’t necessarily stop the destruction, but they can help the islands become much more resilient to storms. The money saved from not importing expensive fuel is another big plus. And of course, the world is going to have to bring carbon pollution to zero to avoid ever-worsening climate shocks. “What we know about climate change, it’s very likely that what they rebuild today will come tumbling down during the next storm,” Judith Enck, the former administrator for the Environmental Protection Agency region that over saw the U.S. Virgin Islands and Puerto Rico, told Earther. “I think Congress needs to pass legislation—and Bernie Sanders’ bill does this—directing FEMA to fundamentally change the electrical grid in the U.S. Virgin Islands and Puerto Rico and fund things like solar microgrids, wind, energy efficiency, and decentralized energy. “I strongly support the Sanders bill and think it would go a long way to improving quality life of millions of Americans,” she added. Yet with Congress and the White House in Republican hands, it’s exceedingly unlikely a bill sponsored by one of the Senate’s most liberal members, and co-sponsored by Democratic presidential hopeful, has much of a chance. Enck said there’s a chance some of it could find its way in the spending bill that has to pass by Dec. 8 or risk a government shut down. 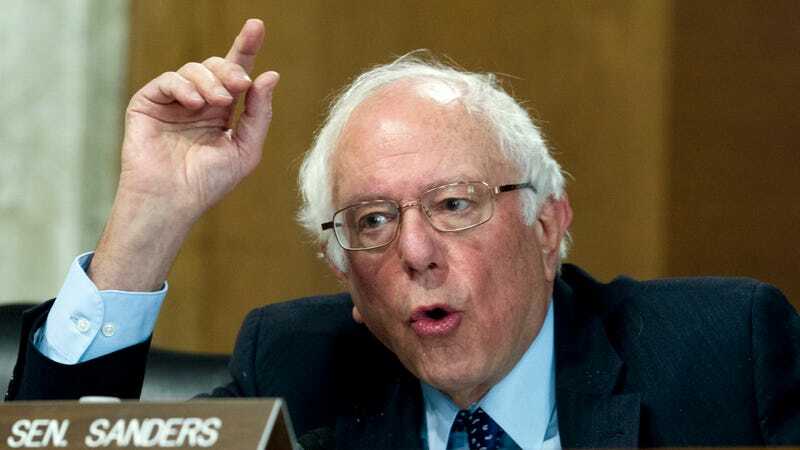 There’s nothing as comprehensive as Sanders’ proposal on the Republican side, though Senator John McCain (R-Ariz.) has also introduced a bill that would repeal the Jones Act, a law that charges a heavy tariff on any items brought to Puerto Rico aboard foreign ships. That’s driven up prices in Puerto Rico and slowed recovery. “McCain’s bill on repealing the Jones Act is a step in the right direction from the Republican camp,” Ponce Ruiz said. What is sure is that something has to happen soon, before more Americans suffer.